TEMPE, Arizona -- The pinned tweet atop Michael Hermosillo's Twitter profile says a lot. Accompanied by a photo of him strolling through the outfield during a recent Angels Spring Training game in Tempe, it reads, "847th overall pick. #Motivated." Four years ago, Hermosillo was a promising prep football player six weeks removed from signing a letter of intent to head to the University of Illinois for a career at running back or defensive back. Despite that pledge, the Angels weren't keen to let the toolsy outfielder get away. The Halos picked Hermosillo in the 28th round of the 2013 Draft and lured him away from football with a substantial signing bonus and an opportunity to pursue his childhood dream. Since then, the Angels' No. 14 prospect -- who was unranked after last season -- has gone from an undeniably dynamic athlete to a legitimate prospect, a status spurred by a breakout 2016 during which he batted .317/.402/.467 with 36 extra-base hits in 77 games. "Last year, I didn't know what was going to happen," the 21-year-old said Friday at Angels camp. "I was pretty lost, to be honest. It was just kind of that things started to click. They gave me the opportunity to go to low-A, and I took advantage of that, went to high-A, did the same thing. This year, I've been talking to people, it's like you want to remember what you did last year, but at the same time, that's in the past. What you did last year has no effect on what you're doing this year." Hermosillo took off in his first taste of full-season ball and rewarded those in the Angels system who long believed he'd find his groove as a baseball player. The Ottawa, Illinois, native was rewarded with a non-roster invitation to Major League camp this spring and performed well there, batting .286/.333/.643 in 14 games. His defensive tools don't lag, either: Hermosillo's field and arm tools are a 50-grade (Major League-average), according to MLB.com, and his speed grades at a 60. "Especially just being around the outfielders, [Mike] Trout, [Kole] Calhoun, [Cameron] Maybin, [Ben] Revere, [Ryan] LaMarre, [Ramon] Flores, all of them, they were awesome," he said. "They took me under their wing, gave me as much info as they could. Shane Robinson, too, they've all been in the big leagues. I just tried to pick their brain as much as possible. Eric Young Jr., man, I'm just trying to think of all the names." Being immersed in that lengthy group of helpful veterans gave Hermosillo a jump-start on his fourth Spring Training. "I literally took something from everybody," he said. "Cam, Eric Young Jr., those guys were really instrumental with trying to just stress certain things here or there, just make sure you're always on top of everything, make sure you're focused, make sure when you do come down here [to Minor League camp], don't let up. Keep doing your thing because you can be up here, too, really quick. I'm just trying to take everything that they told me and make the most of it." 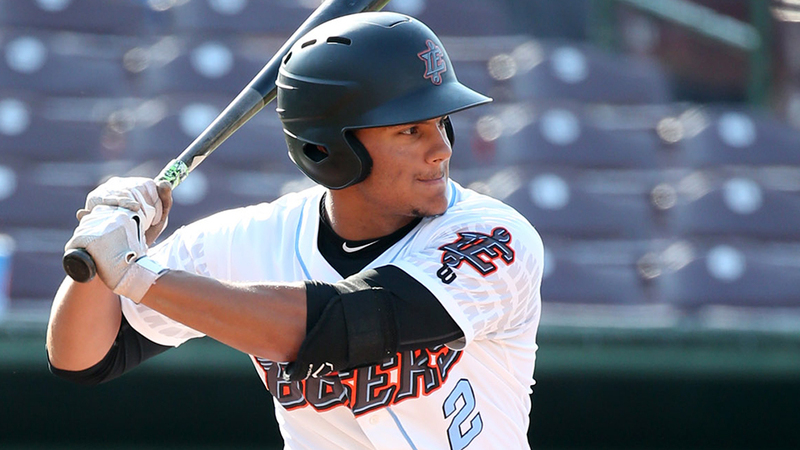 Hermosillo has been seeing action with the Angels' Double-A and Triple-A groups this spring and chatted before catching a bus to a Friday matchup on the Minor League side. Double-A Mobile is Hermosillo's probable 2017 starting point, but he'll likely see action in more big league games this spring, despite being sent down from Major League camp on Wednesday. "My biggest thing this year is just to stay focused every day," he said. "I feel like I'm so close to where I want to be that I don't want to let up. I don't want to think about last year. Obviously, you're always going to take things, like I remember how I felt at the end of last year and how great it was just to have a good year and have something under my belt. Now the only thing I can think of is just being focused on this year, doing the best I can this year just to give me the chance to maybe get to Triple-A or the big leagues at the end of the year. You just never know." Hermosillo has impressed with his mature approach, despite not being a baseball-only player until the summer after he was drafted. His plate discipline especially stands out. In four seasons, he's struck out 162 times and walked 115, reaching base at a .370 pace over 235 games. "Honestly, it's never something that I really worked on," he said. "It's been something that personally has just naturally come to me. I've just kind of always felt like I understood the strike zone. I've never been someone who's chased pitches. "I would say a multitude of things [contribute]. I've just created the good habits of having good at-bats, not giving pitches away, not trying to swing at balls in the dirt or balls at my head but still trying to be aggressive at the same time. That's probably the hardest thing about baseball, finding that in-between about being aggressive but also staying within your zone, not expanding the zone, not chasing pitches." The charismatic outfielder projects himself off the field, as well. Hermosillo is a relatively rare breed of outspoken Minor Leaguer who refuses to shy from expressing his views on societal and political issues on social media, a quality he uses to open doors with teammates rather than build walls. "You just try to be reasonable, man," he said. "I have so many friends that are Trump fans, and we can have conversations back and forth without getting mad at each other, without hating each other. I just wish there was more of that, more dialogue, just being able to understand both sides of the aisle. "I try to joke around about it. I try to be light about it most times. There's times where I am serious, where I really do feel like there's something like, 'OK, now you're offending my intelligence.' Other than that, just the dialogue [is important]. I can talk to any of my teammates about that type of stuff. If I can talk to my teammates about it, then I'm going to sometimes express myself through social media. They understand that there's no bad will. They understand that there are certain people, maybe, that I don't agree with, but at the end of the day, I'm not going to hold [them] to that opinion." Among those teammates aren't just friends and debate partners. There are talented future big leaguers, too, a facet of the Angels system in which Hermosillo and his fellow farmhands believe, despite the much-maligned quality of prospect depth in the system in recent years. "I've never really bought into that," he said. "I've always seen plenty of talented guys in our system and we've always competed against other guys in other systems and done just fine. You kind of let the people out there talk about that type of stuff while we're still getting our work in in here. I'm actually excited to see how everyone does this year. We've got some young guys like Jahmai [Jones, the Angels' top prospect], a guy maybe you guys don't know about right now, [2015 11th-round pick] Jimmy Barnes, big, big kid that just has to figure a couple things out and then he might take off. You have all these guys that are down here right now that people don't really know about." Hermosillo's belief comes from experience. "It's just about them putting their work in, just like I did," he said. "People didn't know about me. People weren't talking about me. Just put your work in, get your head down and stay grinding."